The classic flavors of an Everything Bagel…in cheese! Yep, we did it! We took the flavors blended into the country’s most popular bagel flavor and created this incredible new cheese! Encrusted with onion, garlic and poppy seeds, you’ll think you’re enjoying an Everything Bagel from your favorite bakery. Serve atop crunchy crackers, melt over crusty bread or make the centerpiece of your cheese platter. Horseradish Cheddar Cheese - 8 oz. This is my favorite product I have bought from Dakin Farm. 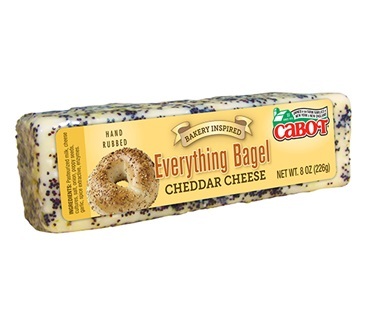 They have so many wonderful selections - but the flavor on the Everything Bagel Cheese is so delicious! I love this cheese, it's the best I've ever had. I use this cheese mainly for breakfast, for snacks, and as gifts to friends with an appreciation quality. It is wonderful straight from the fridge, but even better at room temperature, though it is difficult to wait that long to dig in. I have yet to try it melted, though I imagine it is superb that way. After pining for years since the Cabot garlic cheddar was discontinued, I've finally found the most admirable of substitutes- with a distinct flavor all its own thanks to the poppyseeds. I am trying this for the first time. Just had several slices with mild wheat crackers and was so impressed with the balance of flavors that I immediately added it to my list of must-haves for snacking, hors d'oerves, holiday gatherings, and Christmas gifts. I am looking forward to having this on a bagel, making a grilled cheese with it, and introducing it to all of my friends and family.